Ah, fondue. Some people think of it as the flash-in-the-pot dinner party craze of the 60’s and 70’s, conjuring up thoughts of turtleneck sweaters and expensive gift fondue sets sitting unused for decades. But things are changing for the noble melted cheese dish! With quality cheese more easily accessible to Americans, fondue is experiencing resurgence in a big way and we think this time it’s here to stay. So take a moment to learn a little more about everyone’s favorite communal meal. 1. Fondue is over 400 years old! 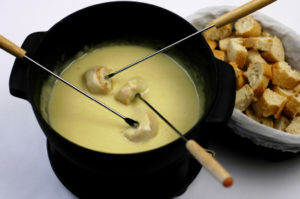 Written records of fondue date back to the late 17th century, when a bare bones version of the dish calling for cheese, wine and bread for dipping appeared in a Swiss cookbook. 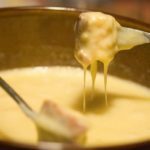 Fondue showed up in print in various other incarnations through the 18th and 19th centuries, the recipes calling for eggs and often construed as something closer to a custard or cheese soufflé than the hot dip that we know it as today. Towards the end of the 19th century recipes began to appear for an emulsified melted cheese concoction, and in the early 20th cornstarch was added to the bill to more easily stabilize the mixture. 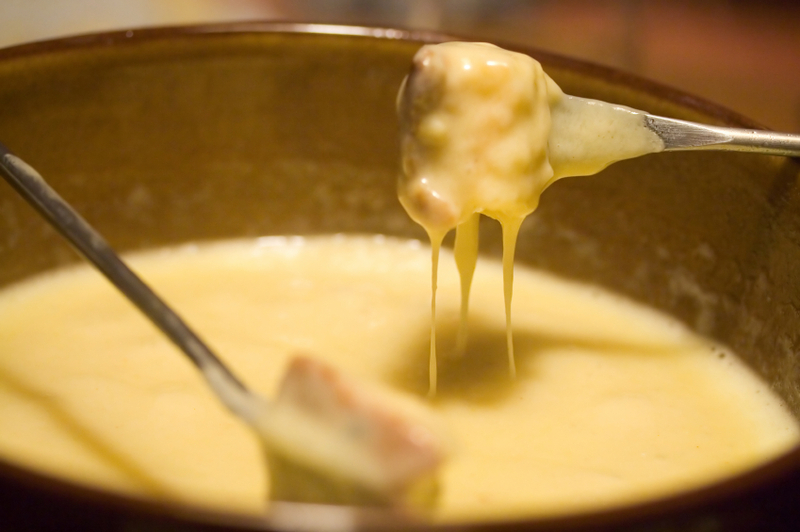 Variations on the theme and regional takes still abounded, the idea of fondue as a hot dish for communal dipping took form and became recognizable throughout Europe. As with most traditional dishes, there is no shortage of regional variations. The well-known Neuchateloise version calls for a balanced mix of Gruyere and Emmental; the Innerschweiz like a blend of Gruyere, Emmental and a spiking of bright Sprinz; the Appenzeller variety uses – you guessed it – Appenzeller cheese, lengthened with warm cream. Whatever the chosen blend, a great fondue is accompanied by cubed bread for dipping, as well as charcuterie and veggies. Can you cover it in cheese? Then ‘due it up. An assortment of pickled or brined treats to cleanse the palate between bites is also a great idea. If you want to know what to drink with fondue, there are two major camps: Black Tea vs White Wine. Some say black tea is better for your digestion. Some say white wine is in the fondue already, why not also have a glass with the meal? We say: drink whatever you like – tea, wine, and even beer all make great accompaniments. We say: Anything goes!… Except double-dipping. Fondue is more than just a meal. The spirit of sitting around a hot pot and sharing a communal meal is essential to the experience and necessitated by the dish. There’s something wonderful about the hands-on element, the light of the flame, and the warmth of the dish that just guarantees a good time. So ditch the misconceptions and warm your cold winter nights with a venerable bubbling pot of cheesy happiness. 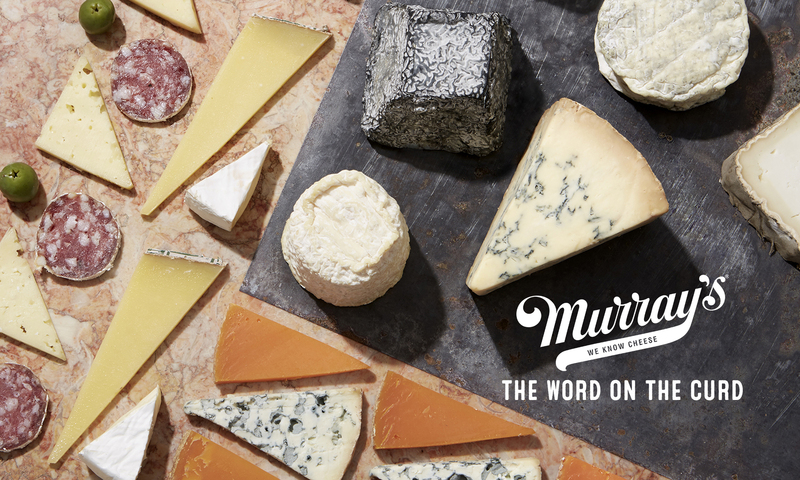 We at Murray’s are here to help! Previous PostPrevious These Are a Few of My Favorite [Murray’s] Things!